The new 6 West apartments in Edwards. 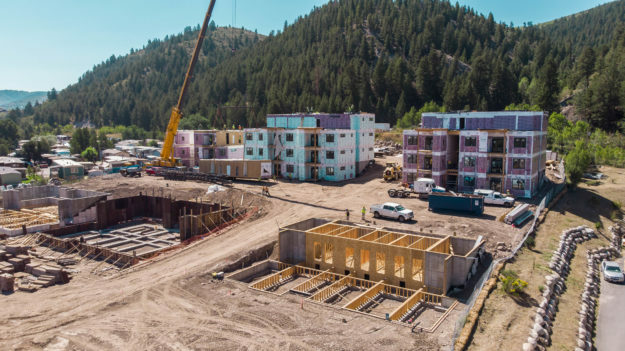 EDWARDS, Colo. — Gore Creek Partners, LLC announced recently that it has begun accepting reservations for 6 West, its new multifamily community in Edwards, with anticipated occupancy of the first buildings by late November. Construction commenced on the 120-unit property in March of this year and full completion is expected by January of 2019. 6 West is located on the south side of US 6 in west Edwards, and will include one, two, and three-bedroom units in nine separate buildings, along with a leasing and amenity center. This facility will house the full fitness center, conference room, business center, great room, kitchen, and outdoor socializing area with seating around a firepit – amenities not seen in any other rental community in the Vail valley. The buildings have been designed in a “mountain modern” architectural style with outdoor green spaces including a “bark park” for pets, and a “tot lot” for kids. Interiors of the residences will offer high-end finishes such as stainless-steel appliances, quartz countertops, walk-in closets, and all units will have forced air heating and air conditioning, which is uncommon in the area. Also available will be a limited amount of covered reserved parking, and a number of large storage units located within each building. Those interested in learning more about leasing opportunities and other aspects of the property can go to the new website at www.6westapartments.com or call 970-922-3636. Gore Creek Partners is a Vail-based private equity firm active in commercial real estate development and investment. The company acquires and develops multifamily and student housing properties in various markets around the United States. Corum Real Estate Group, based in Denver, will handle on-site leasing and property management of the property. Founded over 32 years ago, Corum has been extremely active since inception in resort communities and currently manages over 1,000 residential units from Summit County to Steamboat, specifically including Buffalo Ridge II, Timber Ridge and Lion’s Ridge within the Vail valley. Construction is being completed by Evans Chaffee Construction Group in Avon.